This time we are visiting the lake house just outside of New York City. This lake house is located in upstate. 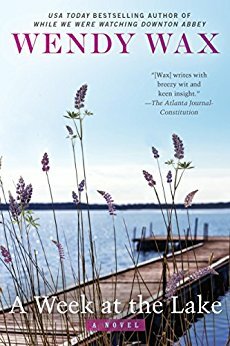 A Week at the Lake is a stand-alone novel by Wendy Wax. She shares her same style with three friends that are facing a huge secret. Emma has invited her two friends Mackenzie and Serena to the lake house. These friends have spent a week at the lake for years together; until recently when Emma decided to distance herself from her friends. Why? Emma is harboring a secret that includes the three friends and her daughter Zoe. She plans to reveal the secret at the lake house. The plans change when Emma has a disagreement with Zoe. When Emma decides to go after her daughter she is struck by an oncoming vehicle. Will the secret be revealed? What impact will this have on Serena, Mackenzie, and Zoe? This novel is interesting, but it was not my favorite. The other two titles shared recently One Good Thing and The Houseat Mermaid Point are definite favorites. The story has a great plot. I loved how she wove the back story of the character of Emma throughout the story. The character that most resonated with me is Mackenzie. She is married but has not children. All authors love their characters to grow and Mackenzie’s arc is how does she feel not having children? Could readers identify with a childless marriage? I too am older and would love to be married with children. I understand this struggle. Wendy’s next novella is a Bella Flora Christmas and is available for preorder now.